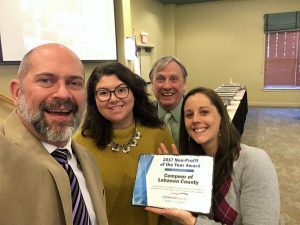 Compeer Named 2017 Non-Profit of the Year! The Lebanon Valley Chamber of Commerce named Compeer of Lebanon County the 2017 Non-Profit of the Year! At its annual Membership Breakfast on December 13th, Lebanon Valley Chamber of Commerce recognized the unprecedented growth and quality of service provided by Compeer of Lebanon Valley to the residents in our county living with a mental health diagnosis. As this year’s winner, Compeer received a donation from the Chamber Foundation for $3,000! Executive Director, Alane Stief, and Board Chairman, Glenn Wikel Jr., accepted the award (show in picture above with Compeer Office Manager, Abby Reinhold, and CompeerCORPS Outreach Coordinator, Brian Green). “This is such a great honor and shows how the power of friendship can change lives,” said Alane Stief. Thank you to the Chamber of Commerce, Compeer’s Board of Directors, our Volunteers and our Friends!